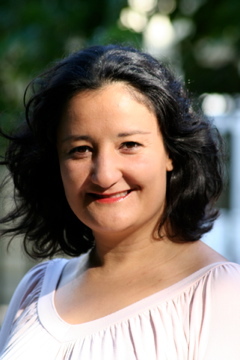 Ayla Kadi studied psychology at TU Berlin from 1999 until 2006, focussing on the course specializations work and organizational psychology as well as clinical psychology. After her studies she worked at Lokales Berufliches Orientierungszentrum in der Alten Feuerwache e.V. (Local vocational orientation center at the old fire station) a non-profit-making association, which is a recognized independent association for offering support and various services such as counselling to young people. Until January 2009 she was employed there as a socio-educational worker. Since then Ms Kadi has been in charge of the subjects Berufsorientierung in der Elternarbeit (Vocational orientation within parental work), Etablierung des Berufswahlpasses (Establishing the careers advice passport) and schulspezifische Koordination (school-specific coordination) at Röntgen-Schule ISS in Berlin-Neukölln as expert on educational questions. Furthermore she has gained vocational experience concerning teacher and disseminator training, particularly with regard to dual training systems. Since March 2013 she is additionally employed at the chair Arbeitslehre/Ökonomie und Nachhaltiger Konsum (Economic Education and Sustainable Consumption) at TU Berlin as graduate teaching assistant. She is mainly in charge of teaching and examination tasks in the field work and profession.